Judge King Denies Sim Hoffman's 995 Motion In Full. Case Will Now Be Set For Trial. Shaddi did not further respond to phone calls or emails asking for further comment about the ruling. She was silent after just one single sentence ending with an exclamation point. After a few recent months of supplemental briefs and the judge’s copious questions about “no medical necessity” and if it can be charged as a criminal offense under PC 550 (a) (6), the court finally ruled in the prosecution’s favor. It didn’t look at every juncture as if it would go that way. It’s been a long journey. 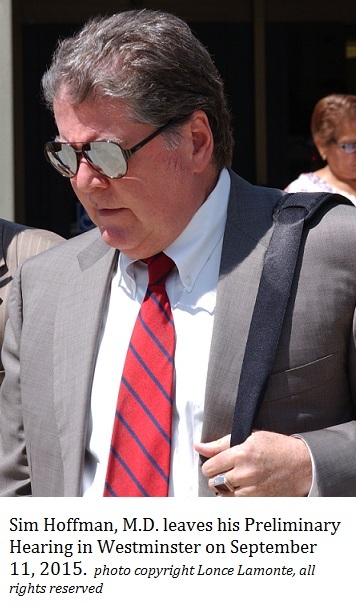 Almost eight years have passed since Dr. Hoffman, a radiologist, was first indicted in 2011 by then District Attorney Tony Rackauckas for egregious workers’ compensation fraud. The case was announced with a big hullabaloo as the Orange County DA held a news conference in its library that was attended by dozens of journalists and camera crews. 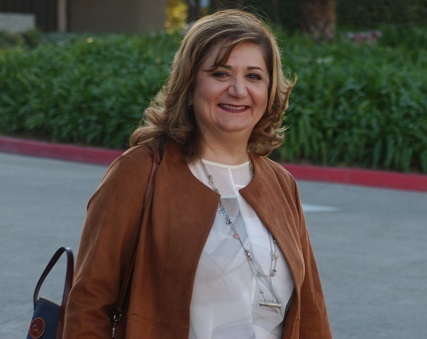 Enormous interest resounded throughout the news channels in this case of a sham sleep center in Buena Park that put out sleep study reports which were pure fantasy containing no medical evidence. There was also news of 3 dimensional MRIs that were never rendered, single fiber EMGs billed to the workers’ comp payers but never performed, and interpreting services not performed but billed on every patient with a Spanish surname. This low class multi-specialty medical practice sent out invoices that were cookie cutter duplicates for every patient. It was a mass mill. The entire spirit was exclusively about billing the workers’ compensation payer in prodigious excess. No concern went to the interest of the patient. Media interest bottomed out as the case sputtered, stalled, and crashed. In December of 2013, the defense won on a successful 995 motion to dismiss that completely wiped out all 884 counts of the indictment. Shaddi was accused of “Johnson error”, which means she failed to present exculpatory evidence to the grand jury. The evidence it is alleged she failed to present is a $75,000 repayment Dr. Hoffman made to State Compensation Insurance Fund. It can be debated whether a $75,000 repayment to SCIF that Hoffman made kicking and screaming can be defined as exculpatory. However, here we are. Shaddi Kamiabipour was devastated but refused to show it. At least she tried not to show her pain. “It’s just a temporary set-back,” she told this writer at that time in December of 2013. However, she couldn’t completely hide her emotion. 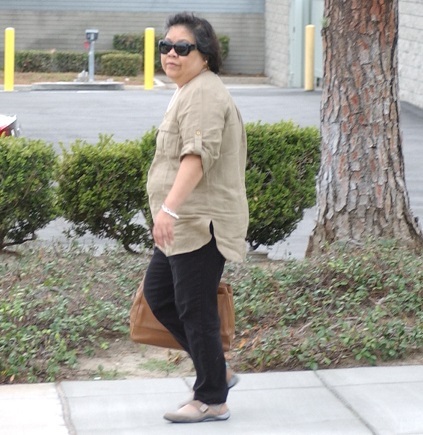 Dr. Sylvia de la Llana, shown here after testifying in the Preliminary Hearing on September 21, 2015, testified "no" when asked if she ever performed any single fiber EMGs while working for Sim Hoffman, M.D. 's practice. photo by Lonce Lamonte, all rights reserved. She refiled the case as a complaint. In January 2014, she had a charging document back in place. This time it wasn’t 884 counts. “I streamlined it,” Shaddi expressed at that time. She expressed that she had learned a lot from the indictment and now she was going to make her case leaner, meaner, and more manageable. She created about 150 counts. The Preliminary Hearing came in September of 2015. Up to the witness stand came Dr. Hoffman’s freak show of former employees who had their individual tales to tell. Witness Douglas Soto took the stand in his jail garb. At that time he was in custody. He had been one of Hoffman’s sleep study technicians. Soto was in jail for drunk driving and other related offenses. He had vandalized the inside of a jail unit. Beverly Mitchell, Hoffman’s former office manager, took to the stand as if she were still in the midst of a nervous break-down. She had emotionally collapsed after her home was raided by a search warrant. She testified that Dr. Hoffman paid her one million dollars as a severance package. It was clearly hush money. She cried as defense attorney Bill Fleming cornered her in lie after lie. She was painted into a corner with her perjuries. Dr. Sylvia de la Llana, a former Hoffman employee doctor, testified that she never performed a single fiber EMG. She didn’t know any doctor in Hoffman’s practice who did. She testified that she regretted not speaking out sooner about improprieties she observed. She was fired when she complained about her name being attached to the billings for single fiber EMGs. Dr. Stuart Strausberg, a radiologist who worked for Hoffman, testified about the MRIs. He was sirly, smart-mouthed, rude, sarcastic, and downright disrespectful to the court. He had an attitude. When asked about 3-D MRIs, he testified that he didn’t always use them. “They can be helpful” he testified. But that was about it. However, the defense heard his testimony differently. Louis Santillan, who was Hoffman’s hearing rep/bill collector, testified that in ~2005-2006, he earned over $400,000 a year. He testified that Hoffman tried to make him an independent contractor, and he fought it. Hoffman fired him over the conflict, he sued, and his case wound up in arbitration. Santillan admitted under heavy questioning by defense lawyer Bill Fleming that he committed several perjuries. Preliminary Hearing magistrate Margaret Anderson bound Dr. Sim Hoffman and Dr. Thomas Heric over for trial. Dr. Heric died in July of 2018, therefore, that’s why he is no longer part of the case. Dr. Hoffman is now alone. In the indictment, Beverly Mitchell and Louis Santillan were also charged. But, in the complaint, neither was charged. Each was given use immunity. After the preliminary hearing, a set of demurrers filed by the defense led up to a writ being sent to the court of appeals. Distilling it all down, in a nutshell of a nutshell, the defense argument was that the prosecution charging document could not list multiple “acts” within one count as a single offense. They insisted that a single act is a single offense. They lost the argument in the 4th District Court of Appeal in Santa Ana in August of 2017. Then came the defense 995 motion to dismiss. They filed it about a year ago. This defense team has given its all to defend Dr. Hoffman. 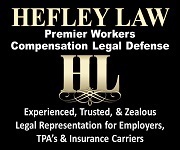 They are powerful defense lawyers. Credit has to be given to Richard Moss and Bill Fleming for being real advocates for their client. They were again and again pulling more rabbits out of their hats. Finally, the 995 motion has been denied in full. Not a single count was dismissed. This feels almost like a miracle after nearly eight years. This case will come back to the court room on March 1st 2019 for a date to be set for trial.